Kadidiatou Diani scored twice and France ended the U.S. national team's 28-game unbeaten streak with a 3-1 victory Saturday in Le Havre, France. It was the first of 10 matches the United States will play before the World Cup. The Americans are the defending champions and could meet France again in the tournament's quarterfinals. France went up in the ninth minute on Diani's goal off a cross from Delphine Cascarino. Diani scored again in the 57th minute to make it 2-0. The 23-year old plays for Paris Saint-Germain. Katoto, Diani's PSG teammate, added a goal in the 78th minute. 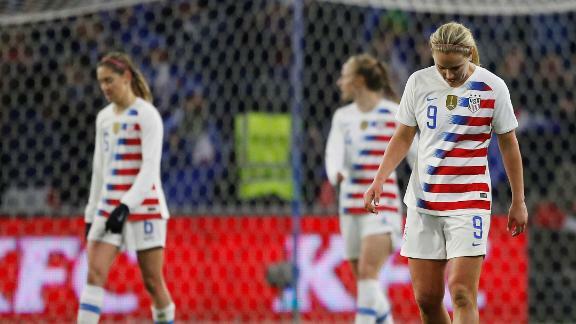 U.S. coach Jill Ellis had to tinker with her starting lineup and rested stars Megan Rapinoe, Tobin Heath and Julie Ertz as a precaution because of minor injuries. Also held out was Kelley O'Hara, still recovering from ankle surgery. Defender Tierna Davidson came in for Emily Fox in the 53rd minute, marking her first appearance since she fractured her left ankle in a match for Stanford in September. Davidson decided to leave the Cardinal with a year of eligibility remaining to focus on making the World Cup team. She was the first overall pick in last week's National Women's Soccer League draft by the Chicago Red Stars. The match at La Stade Oceane was sold out with over 25,000 in attendance. The stadium is one of the nine venues that will host World Cup games. The Americans' next visit to the stadium will be for the final match of the World Cup group stage against Sweden. "I'm not worried," Ellis said following the loss. "We know who we are and what we can do." Next up for the United States is a match against Spain on Tuesday at Estadio Joss Rico Perez in Alicante. The U.S. women trained in Portugal ahead of the two-match European trip.